Reentry refers to the transition of offenders from prisons or jails back into the community. According to the U.S. Department of Justice, Office of Justice Programs more than 650,000 people are released from state and federal prisons annually. Another 9 million cycle through local jails. Research by the Bureau of Justice Statistics published in 2006, has shown that more than two-thirds of state prisoners will be rearrested within three years of their release and more than half (56.7%) are re-incarcerated. The number of offenders and the likelihood of their re-incarceration have made reentry a priority for policy makers and criminal justice researchers and practitioners. Breaking the cycle of reoffending and re-incarceration has many important implications for public safety and policy. High rates of recidivism mean more crime, more victims, and more pressure on an already overburdened criminal justice system. The costs of imprisonment also wreak havoc on state and municipal budgets. In the past 20 years state spending on corrections has grown at a faster rate than nearly any other state budget item. The U.S. now spends more than $85 billion on federal, state, and local corrections. Because reentry intersects with issues of health and housing, education and employment, family, faith, and community well-being, many federal agencies are focusing on the reentry population with initiatives that aim to improve outcomes in each of these areas. In July of 2005, newly-appointed Director of the North Dakota Department of Corrections and Rehabilitative Services, Leanne Bertsch, re-affirmed North Dakota’s participation in the NIC TPC Initiative. Since that time, the Department has been leading the North Dakota TPC effort, with the support of the State Workforce Development Agency, North Dakota Job Services, the North Dakota Department of Human Services, and the North Dakota Housing Finance Agency. Indiana has been participating in the National Institute of Corrections Transition from Prison to the Community (TPC) Initiative since 2003. The effort has been revitalized under the direction of Indiana Department of Correction Commissioner J. David Donahue in 2005 under the title “Road to Reentry.” Commissioner Donahue has received leadership support from the Indiana Governor and a wide range of state agencies. The mission set out by these leaders is: “To enhance public safety through improving the successful transition of offenders to the community. Known as the New York State Interagency Re-Entry Task Force and Transition from Prison to Community Initiative (TPCI), New York began its reentry work in 2003, and was selected to participate in NIC’s Transition from Prison to the Community Initiative (TPC) in early 2004. The State of Oregon has been participating in the National Institute of Corrections Transition from Prison to the Community (TPC) Initiative since its inception, as a model site. The Oregon Department of Corrections has made a commitment to what it calls “The Oregon Accountability Model” which provides a foundation for inmates to lead successful lives upon release. The Model has six components: Criminal Risk Factor Assessment and Case Planning; Staff-Inmate Interactions; Work and Programs; Children and Families; Reentry; and Community Supervision. Michigan’s participation in the NIC’s Transition from Prison to the Community (TPC) Initiative began in 2003, and is known as the Michigan Prisoner ReEntry Initiative (MPRI). Michigan has received technical assistance from the National Governors Association (NGA) in addition to NIC, and has a goal of having the entire state involved in the MPRI Model by October 2007. The VISION of the Michigan Prisoner ReEntry Initiative is that every prisoner released from prison will have the tools needed to succeed in the community. The TPC effort in Rhode Island is guided by the Rhode Island Reentry Steering Committee. In April of 2004, Georgia was accepted as a participant in the National Institute of Corrections’ Transition from Prison to the Community (TPC) Initiative. Since that time, key leaders from numerous agencies have collaborated on what is called the Georgia Reentry Impact Project (GRIP). They work together on a variety of teams that are focused on improving offender reentry activities throughout the State. Missouri has been engaged in NIC’s Transition from Prison to Community (TPC) Initiative since 2002. The initiative, known as the Missouri Reentry Process (MRP) began under the leadership of former Director of Corrections, Gary Kempker, and is now supported and continues to move forward via the leadership of the current Director of Corrections, Larry Crawford. A professional overview of the Las Colinas Detention & Reentry Facility located in San Diego, California. "The purpose of this cross-jurisdictional inaugural event is to advance evidence-based and promising reentry practices throughout the Bureau of Prisons, in each of the 50 states, and within the country's largest local jail systems." This three-hour national discussion and broadcast by the National Institute of Corrections (NIC) focuses on the unique opportunities and challenges of including victims in the offender reentry process. Current points in the criminal justice reentry continuum where victims can and should have a voice are explored. By including victims we can obtain more balanced information about the offender and their offense history which can positively impact reentry decisions. This approach can result in better outcomes for the community, offenders and victims through enhanced offender accountability, increased victim satisfaction, and community safety. During this program, presenters will: identify the value of involving victims throughout the offender reentry process, while ensuring victims’ rights are addressed; address corrections professionals concerns regarding interacting with victims and addressing issues of confidentiality; provide tips, tools and strategies for integrating victims into the reentry process; and identify resources, collaborative partnerships and funding opportunities for including victims in reentry programs. Roman, Caterina G. and Nathan Link. Temple University (Philadelphia, PA). In this report we describe the characteristics of adult male returning prisoners with child support orders and debt, and examine whether participation in SVORI was associated with greater services receipt than those in the comparison groups (for relevant services such as child-support services, employment preparation, and financial and legal assistance). "This review focuses on two complementary questions regarding incarceration, prisoner reentry, and communities: (1) whether and how mass incarceration has affected the social and economic structure of American communities, and (2) how residential neighborhoods affect the social and economic reintegration of returning prisoners." "Purposeful Neighboring: Creating Reentry-Ready Communities is not intended to be a long, academic book. It is rather a practical book birthed in the fires of providing prisoner reentry services at the local, county, and state levels. Hopefully, it will inspire to you see the real problem and be a part of the real solution … My basic premise is that reentry is NOT the responsibility of the local department of corrections – it is EVERYONE’S responsibility. Until our communities step up and own the responsibility for reintegrating ex-offenders back into the fabric of society, the bitter cycle of recidivism will continue" (p. 5). This publication explains how. Seven chapters comprise this document: whether we really want reentry; understanding recidivism; the reentry reformation; the vision for a reentry-ready community; how to run a local prisoner reentry coalition; fitting it into the larger plan; and the National Reentry Resource Directory. National Reentry Resource Center (New York, NY). "This brief from the National Reentry Resource Center profiles seven states in which recidivism has significantly decreased over the last decade according to several different measures. Using the most up-to-date data from Arizona, Colorado, Georgia, Michigan, North Carolina, South Carolina, and Texas, the brief highlights data on people under community supervision for a more comprehensive picture of recidivism." Council of State Governments (CSG) Justice Center (New York, NY). "This guide lists the available research on the effectiveness and best practices of residential reentry centers (commonly known as halfway houses). Corrections and reentry professionals can use this compendium guide to review the most relevant resources informing halfway house practices." Independent Voter Network (IVN) (San Diego, CA). This article briefly describes the successful use of NIC’s Transition from Jail to Community (TJC) at San Diego’s East Mesa Reentry Facility (EMRF) and the Community Transition Center (CTC). Labrecque, Ryan M., Myrinda Schweitzer, and Paula Smith. George Mason University, Center for Advancing Correctional Excellence (ACE!) (Fairfax, VA). This article discusses "the findings of a study examining the effect training on CCPs has on subsequent officer use of [supervision] skills" (p. 21). "Adult Redeploy Illinois (ARI) was designed as a response to the high numbers of non-violent offenders incarcerated in Illinois’ prisons at great cost to the state. Participating ARI counties divert non-violent offenders from prison and into community corrections programs. These programs are less expensive than prison and designed to be more effective at reducing recidivism" (p. i). Sections of this report include: key findings; introduction; about Adult Redeploy Illinois; methodology; findings—client data; findings—program planning; findings—program implementation; findings—client interviews; implications for policy and practice; and conclusion. "With 127 diversions, the DuPage County ARI program exceeded its goal of reducing prison commitments of the non-violent target population by 25 percent. Probation officers reported offering clients evidence-based, cognitive-behavioral supervision and services. Overall, clients highly regarded the ARI program and their probation officers" (p. iii). This is essential reading for those people working or interested in offender reentry efforts. The report looks at correctional systems in the United States, the federal government's involvement in offender reentry programs, and the Second Chance Act (P.L. 110-199). Sections of this report include: correctional system statistics—population in correctional facilities, offenders under community supervision, and recidivism; a brief literature review for offender reentry—offender reentry defined, and program effectiveness--the "What Works" literature; federal offender reentry programs—Department of Justice , other federal agencies, and coordination between federal agencies; and conclusion. This report describes how four law enforcement agencies, selected as learning sites, utilized the principles described in “Planning and Assessing a Law Enforcement Reentry Strategy”. “The goals of the learning site project were not to identify a gold standard or the most comprehensive law enforcement-driven reentry program in the nation, but rather to report how diverse agencies implemented strategies in key areas of reentry that many professionals on the front lines of this work face. Although the intended audience is primarily practitioners who have been charged with developing a reentry strategy for their agencies, it is also meant to have value for those individuals and agencies that partner with or hope to partner with law enforcement agencies to ensure that more individuals reenter communities safely and successfully” (p. 3). Three sections follow an executive summary: collaboration—coordination and partnerships; program terms—activities and scope; and data collection and analysis—process and outcome. Also included are profiles of the four law enforcement agencies evaluated. “These checklists can help familiarize state leaders with key issues related to recidivism reduction, and help them honestly evaluate strengths and weaknesses in their reentry efforts through enhanced communication and coordination.” Checklists are targeted for each of the following—executive and legislative policymakers, state corrections administrators, and state reentry coordinators. The checklists can be used to educate policymakers, to assess the comprehensiveness of their recidivism strategies, for strategic planning, and for periodically auditing reentry efforts. Tolbert, Michelle, and Laura Rasmussen Foster. RTI International (Research Triangle Park, NC). facility- and community-based programs. This report offers guidelines, tools, and resources to support implementation of the framework" (4). Delaney, Ruth, Ram Subramanian, and Fred Patrick. Vera Institute of Justice. Center on Sentencing and Corrections (New York, NY). "To support the implementation of new partnerships and strengthen existing ones, this report compiles lessons from the field, offering implementation guidance to programs seeking to develop, expand, or enhance postsecondary educational programming in corrections settings" (p. 6). Tolbert, Michelle, Laura Rasmussen Foster, Matthew DeMichele, and Stacey Cataylo. National Center for Innovation in Career and Technical Education (NCiCTE) (Research Triangle Park, NC). "This report is designed to document information currently available on programs that prepare individuals for nondegree credentials in adult corrections facilities" (p. 1). This report uses observations from the first full year of the Promoting Reentry Success Through Continuity of Educational Opportunities (PRSCEO) demonstration projects to tell the story of each site’s implementation of the Reentry Education Model and to look across the three sites to identify the model’s strengths and limitations. Rampey. Bobby D., Shelley Keiper, Leyla Mohadjer, Tom Krenzke, Jianzhu Li, Nina Thornton, and Jacquie Hogan. National Center for Education Statistics (Washington, DC). "The U.S. PIAAC Survey of Incarcerated Adults was designed to provide information to policymakers, administrators, educators, and researchers who are developing education and training policies and programs for incarcerated adults. This report highlights data from the survey’s extensive background questionnaire and direct assessments of cognitive skills. It examines the skills of incarcerated adults in relationship to their work experiences and to their education and training in prison" (p. 1). Suitts, Steve, Katherine Dunn, Nasheed Sabree. Southern Education Foundation (SEF) (Atlanta, GE). According to the report, juvenile justice programs that help prevent young people from becoming re-offenders could save society about $3.9 million per youth. This report highlights several programs showing that education in juvenile justice programs can be successful. This report explores the lived experiences of previously incarcerated students when they come to college. It documents what these students report as the factors that encouraged and supported them, and the factors that discouraged and, in some cases, blocked their transitions to college and their achievements there. Utilizing participatory research methods, this report highlights the voices of these students and draws on their knowledge to offer invaluable insight into the collateral consequences—economic, structural, racial, familial, and personal—of mass incarceration. On November 19, 2012, the U.S. Department of Education (DoEd) hosted a Summit on Education in Correctional Facilities to address correctional and reentry education for youth and adults. The goal was to ensure that formerly incarcerated individuals have the tools and supports necessary to become positively engaged members of society who are prepared for 21st Century employment. The meeting identified several critical issues, many of which apply to both adult and youth offenders. The policy recommendations presented here reflect the insights, observations, and knowledge gained from these critical conversations. "Across the country, students in the juvenile justice system are struggling in school. Research suggests that many enter the juvenile justice system well behind grade-level. In the absence of thoughtful programming, once they enter the juvenile justice system, they may fall further behind. Too many end up dropping out of school upon return to their communities. This publication examines one particular initiative that has shown great success in combating this problem—the Pennsylvania Academic and Career/Technical Training Alliance (PACTT)—and provides suggestions for replication in juvenile justice programming across the country. It also sets forth ideas for collecting data to measure the success of initiatives like PACTT and embedding in policy the general reform principles PACTT identified" (p. 5). The following parts are contained in this toolkit: introduction—the national context, and launching a project; PACTT practice components—creating a rigorous and relevant academic program, supporting students in career-readiness, seamless transitions and effective re-entry, and tracking data to serve individual students, improve programs, and inform policy; complying with the law and pursuing policy change; and conclusion. Tools included are: "Tool I: PACTT Components Checklist";" Tool II: A Checklist for Policies that Support PACTT Principles"; "Tool III: PACTT Data Logic Model" by Michael Norton and Tracey Hartmann; "Tool IV: PACTT Data Measures" by Norton and Hartmann; Tool V: Digest of Key Federal Laws"; :Tool VI: Desk Manuals on PACTT for Career and Technical Education Specialists and for Academic Specialists" by the Pennsylvania Department of Human Services Bureau of Juvenile Justice Services; "Tool VII: Sample PACTT Affiliate Agreement"; "Tool VIII: PACTT Employability/Soft Skills Manual" by Pennsylvania Academic and Career/Technical Training Alliance (PACTT); and "Tool IX: Federal Policy Recommendations" by Juvenile Law Center, Open Society Foundations, Pennsylvania Academic and Career/Technical Training Alliance, the Racial Justice Initiative, and the Robert F. Kennedy Juvenile Justice Collaborative. "Technology has transformed the way we approach most daily tasks and activities. It plays a role in how we apply for and perform on a job, communicate with friends and family, access government and other services, manage our finances, and purchase entertainment. Technology also enables our learning … The policies and practices of federal, state, and local corrections agencies, including the juvenile justice system, severely hinder the ability of correctional education programs to enable learning through technology … The primary concern about adopting educational technology in corrections is the potential for security breaches. Other reasons include, but are not limited to, insufficient resources and staff capacity to purchase, implement, maintain, and monitor advanced technologies … This report is designed to inform federal, state, and local corrections and correctional education administrators as they explore ways to securely and cost effectively provide advanced technologies in corrections facilities to help strengthen and expand educational and reentry services. It describes the current status of these technologies in corrections, existing and emerging approaches to providing such services in facilities, and the successes and challenges of early implementers. The report concludes with a set of recommendations that align with the National Education Technology Plan’s five overarching goals" (p. 1-3). Sections of this report include: introduction; overview; current status of advanced technologies in corrections; mobile device vendors providing educational technology in corrections; successes and challenges of early implementers; international use of technology in correctional education delivery; recommendations for adopting educational technology in corrections; information technology terminology; and the Ohio Department of Rehabilitation and Correction's Policy on Internet Access to Prisoners. This study examines the effectiveness of correctional education for adults and for juveniles, and the challenges associated with this programming. Five chapters are contained in this report: introduction; whether correctional education for incarcerated adults is effective; a systematic review of correctional education programs for incarcerated juveniles—results for corrective reading, computer-assisted instruction, personalized and intensive instruction, other remedial instruction programs, vocational/career technical education, and GED completion; RAND Correctional Education Survey—results for correctional education programs today, funding and the impact of the 2008 recession, postsecondary education, use of technology and preparedness for implementation of the 2014 GED exam, and outcome indicators and postrelease measures of success; and conclusion and recommendations. "The results of the meta-analysis are truly encouraging. Confirming the results of previous meta-analyses—while using more (and more recent) studies and an even more rigorous approach to selecting and evaluating them than in the past—the study shows that correctional education for incarcerated adults reduces the risk of postrelease reincarceration (by 13 percentage points) and does so cost-effectively (a savings of five dollars on reincarceration costs for every dollar spent on correctional education). And when it comes to postrelease employment for adults—another outcome key to successful reentry—researchers find that correctional education may increase such employment … Overall, this study shows that the debate should no longer be about whether correctional education is effective or cost-effective but rather on where the gaps in our knowledge are and opportunities to move the field forward" (p. iii-iv). “In this report, we [the authors] examine the evidence about the effectiveness of correctional education for incarcerated adults in the United States. By correctional education, we mean the following: adult basic education (ABE): basic skills instruction in arithmetic, reading, writing, and, if needed, English as a second language (ESL); adult secondary education (ASE): instruction to complete high school or prepare for a certificate of high school equivalency, such as the General Education Development (GED); vocational education or career and technical education (CTE): training in general employment skills and in skills for specific jobs or industries; and postsecondary education (PSE): college-level instruction that enables an individual to earn college credit that may be applied toward a two-year or four-year postsecondary degree. Although some may consider life skills programs a part of correctional education, our project focuses specifically on the four types of academic and vocational training programs summarized above. We also limit our focus to correctional education programs provided in the institutional setting, as opposed to postrelease or community-based programs. Finally, our focus is on correctional education programs provided at the state level” (p. 1). Six chapters comprise this report: introduction; study methodology; the relationship between correctional education and recidivism; the relationship between correctional education and employment; the relationship between computer-assisted instruction and academic performance; and conclusions. Inmates who participated in correctional education programs recidivated 43% less, were 13% more likely to find jobs post-release, and learned just as well using computer-assisted instruction as being taught face-to-face. Appendixes provide summaries of the studies included in the recidivism, employment, and computer-assisted instruction meta-analyses. Walter, Rebecca J., Jill Viglione, and Marie Skubak Tillyer. Housing Policy Debate 27, no. 5 (2017): 1-17. Council of State Governments Justice Center . (New York, NY). "Used in conjunction with other housing tools and services, this questionnaire can help reentry service providers improve clients’ housing success and create a foundation for improved reentry success and reduced likelihood of recidivism." Umez, Chidi, Jan De la Cruz, Maureen Richey, and Katy Albis. Council of State Governments Justice Center (New York, NY). CareerOneStep Business Center (Washington, DC). "Each year, more than 700,000 men and women are released from prisons, and when we encourage these individuals and adjudicated youth to take advantage of services that help them become viable and successful in the workplace, everyone in the community benefits. One of the greatest challenges for many employers is trying to sort through myths and facts about these returnees. Below are several of the more common myths that have been highlighted and addressed" regarding life experience, soft skills, occupational training, and workplace advantages. American Civil Liberties Union (ACLU). Trone Private Sector and Education Advisory Council (New York, NY). Bae, John, Finley Kate, Margaret diZerega, and Sharon Kim. Vera Institute of Justice (New York , NY). Annie E. Casey Foundation (Baltimore, MD). 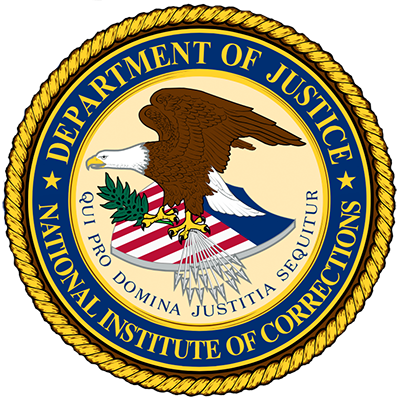 National Correctional Industries Association (NCIA) (Baltimore, MD) and the National Institute of Corrections (NIC) (Washington, DC). This guide "is specifically designed to empower each Correctional Industries organization, no matter the size or structure, to design and implement its program with an emphasis on maximizing system impact. The model supports implementing effective strategies through the context of work. The results are focused on increasing an individual’s success after release." Green for All (Oakland, CA). "Re-entry programs that prepare individuals with little work experience or marketable skills for employment, implemented at scale, have the potential to salvage generations of potentially productive members of society. This paper considers the unique opportunities that the green economy – and green re-entry programs – can offer this chronically underserved population to find gainful employment necessary to escape a cycle of poverty, crime and recidivism. Jobs in the burgeoning green economy, we argue, hold the promise of not just employment prospects but greater accessibility to career jobs that pay sustainable wages" (p. 4). This brief, from the CSG Justice Center, is designed to help state and local officials better support young adults in the justice system. It identifies these young adults’ distinct needs, summaries the limited research available on what works to address these needs, and provides recommendations for steps that policymakers, juvenile and adult criminal justice agency leaders, researchers, and the field can take to improve outcomes" (website). Part I—How Young Adults Are Developmentally Different from Youth and Older Adults: how young adults are distinct from youth; how young adults are distinct from adults; and young adults by the numbers--arrest rates, incarceration rates, and recidivism rates. Part II—Opportunities and Challenges to Meeting Young Adults' Needs: young adults under justice system supervision have distinct needs and few programs exist that are proven to effectively meet these needs—criminal thinking and behavior, education, employment, mental health and substance use, and transition to independence; young adults face systemic barriers to meeting their needs—aging out of protective networks and lack of coordination across service systems, and collateral consequences. Part III—Recommendations: four recommendations; and promising models for young adults under justice system supervision—Multisystemic Therapy for Emerging Adults (MST-EA), and the Roca nonprofit organization in Massachusetts; and increasing cross-systems coordination to improve outcomes for young adults in Iowa—the Iowa Collaboration for Youth Development (ICYD). “The Social Security Administration (SSA), through its Supplemental Security Income (SSI) and Social Security Disability Insurance (SSDI) programs, can provide income and other benefits to persons with mental illness who are reentering the community from jails and prisons. The SSI/SSDI Outreach, Access and Recovery program (SOAR), a project funded by the Substance Abuse and Mental Health Services Administration, is a national technical assistance program that helps people who are homeless or at risk for homelessness to access SSA disability benefits. SOAR training can help local corrections and community transition staff negotiate and integrate benefit options with community reentry strategies for people with mental illness and co-occurring disorders to assure successful outcomes.” This document addresses: mental illness, homelessness, and incarceration; incarceration and SSA Disability benefits; role of transition services in reentry for people with mental illness; access to benefits as an essential strategy for reentry; SOAR collaborations with jails; SOAR collaborations with state and federal prisons; and best practices for assessing SSI/SSDI as an essential reentry strategy—collaboration, leadership, resources, commitment, and training. The Behavioral Health Framework developed to “help professionals in the corrections and behavioral health systems take a coordinated approach to reducing recidivism and advancing recovery” is explained (p. 2). Sections of this publication cover: building effective partnerships through a shared vision; health care reform and opportunities for expanded access to behavioral health services; prioritizing enrollment to facilitate transition; the risk-need-responsivity (RNR) model; implications for successful transition and reentry; Guidelines 1 and 2—Assess; Guidelines 3 and 4—Plan; Guidelines 5 and 6—Identify; and Guidelines 7 through 10—Coordinate. Appendixes to this document are: “Evidence-Based Practices and Programs for Individuals with Behavioral Health Needs in the Criminal Justice System”; and “Information Sharing in the Criminal Justice-Behavioral Health Context: HIPAA and 42 CFR”. “Failure to become employed after release is a major factor contributing to the high rate of recidivism. Having a record of arrest, conviction or imprisonment functions as a significant barrier to employment since employers generally view ex-offenders as potentially untrustworthy workers and insurance companies usually designate ex-offenders as being “not bondable” for job honesty … The bonds issued by the FBP [Federal Bonding Program] serve as a job placement tool by guaranteeing to the employer the job honesty of at-risk job seekers. Employers receive the bonds free-of-charge as an incentive to hire hard-to-place job applicants as wage earners. The FBP bond insurance was designed to reimburse the employer for any loss due to employee theft of money or property with no deductible amount to become the employer’s liability (i.e., 100% bond insurance coverage). The USDOL [U.S. Department of Labor] experiment has proved to be a great success, with over 42,000 job placements made for at-risk job seekers who were automatically made bondable. Since approximately 460 proved to be dishonest workers, bonding services as a job placement tool can be considered to have a 99% success rate.” Information is provided for: program background; highlights of the Federal Bonding Program; what to do if you are seeking bonding; procedures for bond purchases and management; Directory of State Bonding Coordinators; marketing tools; and news and resources. “Employment providers are already serving large numbers of individuals released from correctional facilities or who are required to find jobs as conditions of their probation or parole. Yet the corrections, reentry, and workforce development fields have lacked an integrated tool that draws on the best thinking about reducing recidivism and improving job placement and retention to guide correctional supervision and the provision of community-based services. To address this gap, this white paper presents a tool that draws on evidence-based criminal justice practices and promising strategies for connecting hard-to-employ people to work. It calls for program design and practices to be tailored for adults with criminal histories based on their levels of risk for future criminal activity” (p. v). Sections of this publication include: introduction to the relationship between employment and recidivism; what works to reduce recidivism—principles for improving outcomes among unemployed individuals with corrections system-involvement; proven and promising practices for improving outcomes for hard-to-employ individuals; and the resource-allocation and service-matching tool—an integrated approach to reducing recidivism and improving employment outcomes. Martin, Karin D., Sandra Susan Smith, and Wendy Still. Harvard Kennedy School Malcolm Wiener Center for Social Policy Program in Criminal Justice Policy and Management (Cambridge, MA), and National Institute of Justice (NIJ) (Washington, DC). The "authors discuss the long-term and unintended consequences of criminal justice financial obligations (CJFOs): fines, forfeiture of property, court fees, supervision fees, and restitution" (p. 2). Consumer Financial Protection Bureau (CFPB) (Washington, DC). This publication "is a financial empowerment toolkit. What does that mean? Financial empowerment includes financial education and financial literacy. It also focuses on helping individuals build their ability to manage money as well as access and use financial services that work for them. The toolkit is a collection of important financial empowerment information and tools you can choose based on the current needs and goals of the people you serve" (p. 5). Two-thirds of those released from prison in the United States will be re-arrested within three years, creating an incarceration cycle that is detrimental to individuals, families, and communities. There is tremendous public interest in ending this cycle, and public policies can help or hinder the reintegration of those released from jail and prison. This review summarizes the rigorous evidence on the effectiveness of programs that aim to improve the reintegration and rehabilitation of the formerly-incarcerated. While there is a need for much more research on this topic, the existing evidence provides some useful guidance for decision-makers. The importance of evaluating existing and new strategies is also discussed. COMMUNITY CORRECTIONS IS in the early stages of its renaissance. Reawakened from the late 1970s through the 1990s of “nothing works” and zero tolerance for violators, and driven by political consensus that mass incarceration is a failed criminal justice response, community corrections is on a path of rediscovery and new learning. Since then, reentry has replaced revocation as the word du jour, backed up with a host of new innovations in supervising and rehabilitating offenders to reduce recidivism (e.g., validated, actuarial risk assessment tools; cognitive treatment programs; motivational interviewing). However, even with all of these new best practices and evidence-based advances in community corrections, there is a recognition that long-term successful reintegration will only take place when there is a coordinated and collaborative effort by all stakeholders working with justice involved individuals in the community. The purpose of this document is to provide an overview of the offender reentry literature, offender outcomes, and the reentry initiatives that may work to improve public safety. NIJ investments will be noted and appropriate references provided. "This brief from the National Reentry Resource Center highlights advancements made in state and local governments’ approaches to reentry and reducing recidivism since the passage of the Second Chance Act in 2008. It underscores the involvement of diverse constituencies and systems in these efforts, the field’s increasing understanding and application of what works to reduce recidivism, and promising recidivism outcomes in a number of states." Federal Interagency Reentry Council (Washington, DC). The Reentry Council "has developed a robust set of policies, programs, and training materials to support the reintegration of formerly incarcerated individuals and reduce barriers for those with a criminal record … The Reentry Council’s path forward will be guided by an overarching commitment to realizing the goals described in this report – and ensuring that the tools for successful reentry reach the communities that need them most" (p. 75). Jonson, Cheryl Leo, and Francis T. Cullen.Crime and Justice 44, no. 1 (2015): 517-576. Issues surrounding reentry programs for inmates are discussed. "Only in the past decade has prisoner reentry been “discovered” and become a central policy concern in the United States … A growing number of programs have been created in prisons and the community. Implementing them effectively, however, poses substantial challenges" (p. 517). Root & Rebound (Oakland, CA). This guide is designed to be a resource of legal information that people can turn to about issues along the path of reentry. It is comprehensive in scope, covering nine areas of law and civic life: housing, public benefits, parole & probation, education, understanding & cleaning up your criminal record, ID & voting, family & children, court-ordered debt, and employment. Center for Effective Policy (Washington, DC). "This policy brief offers fodder for the state’s Justice Reinvestment leaders as they contemplate the changes necessary to increase the system’s focus on recidivism reduction and achieve results" (p. 2). Sections of this brief cover: key findings; the high cost of recidivism in Massachusetts-- incentive to reform, post-release supervision, step downs, and sentence length; evidence-based reentry strategies—post-release supervision, transitional housing, employment services, substance abuse and mental health, and multiservice reentry; collateral sanctions and criminal records in Massachusetts; how much reentry programs can reduce recidivism; conditions of confinement and recidivism risk; state reentry efforts—comprehensive reentry models (in Minnesota, Michigan, and Maryland), and funding reentry initiatives (justice reinvestment in Arkansas, Hawaii, South Dakota, and pay-for-success financing—California, Massachusetts, New York, and Oklahoma); justice reinvestment and effective supervision; and a five-part reentry plan for reducing recidivism in Massachusetts. "Reentry refers to the transition of offenders from prisons or jails back into the community. According to the U.S. Department of Justice, Office of Justice Programs more than 650,000 people are released from state and federal prisons annually. Another 9 million cycle through local jails. Research by the Bureau of Justice Statistics published in 2006, has shown that more than two-thirds of state prisoners will be rearrested within three years of their release and more than half (56.7%) are re-incarcerated. The number of offenders and the likelihood of their re-incarceration have made reentry a priority for policy makers and criminal justice researchers and practitioners. Breaking the cycle of reoffending and re-incarceration has many important implications for public safety and policy. High rates of recidivism mean more crime, more victims, and more pressure on an already overburdened criminal justice system. The costs of imprisonment also wreak havoc on state and municipal budgets. In the past 20 years state spending on corrections has grown at a faster rate than nearly any other state budget item. The U.S. now spends more than $85 billion on federal, state, and local corrections. Because reentry intersects with issues of health and housing, education and employment, family, faith, and community well-being, many federal agencies are focusing on the reentry population with initiatives that aim to improve outcomes in each of these areas" (p. 3). This annotated bibliography addresses issues surrounding the reentry of offenders into the community. Entries are organized according to: reentry websites; reentry in general; reentry by category for jails, prisons, victims of crimes, community and family support, education, employment and housing, health and safety, and special populations; and resources with earlier publication dates. Recognizing the importance of effective reentry practices at the federal, state, and local levels, in September 2015, the U.S. Department of Justice, Federal Bureau of Prisons (BOP), and the National Institute of Corrections (NIC) co-sponsored the National Reentry Symposium: Promising Practices and Future Directions.Throughout the two-day session, federal and state representatives from each of the BOP’s six national regions met as teams to discuss methods to enhance federal and state collaborative efforts within their regions.The culmination of the Symposium was the development of regionally based reentry action plans designed to reduce the likelihood of recidivism through improved coordination and collaboration and the delivery of enhanced evidence-based programs and services. This report is a summary of that meeting. Access is provided to a collection of Snapshots that discuss issues central to offender reentry. “Each Snapshot briefly describes the issue, summarizes Reentry Council accomplishments to date, lays out the Council’s priorities moving forward, and points to key resources and links.” These cover: employment; education; housing; public safety; justice-involved veterans; child support; women and reentry; reentry in reservation communities; children of incarcerated parents; access to health care; and juvenile reentry. This online learning resource is an essential ingredient in the development of programs designed to help offenders reenter the community upon their release from jail. This program contains the following nine modules: getting started; leadership, vision, and organizational culture; collaborative structure and joint ownership; data-driven understanding of local reentry; targeted intervention strategies; screening and assessment; transition plan development; targeted transition interventions; and self-evaluation and sustainability. “In the past decade, attention to the challenges associated with people exiting state and federal prisons has increased tremendously. This increased attention is for good reason, as the impact of prisoner reentry on the well-being of individuals, families, and communities is well documented. Yet for every person released from prison annually, approximately 12 people exit local jails … NIC [National Institute of Corrections] launched the Transition from Jail to Community (TJC) initiative in 2007 to address the specific reentry challenges associated with transition from jail … More comprehensive than a discrete program, the TJC model is directed at long-term systems change and emphasizes a collaborative, community-based orientation … This report describes the TJC initiative, discusses the implementation experiences in all six learning sites, and presents findings from the implementation and systems change evaluation” (p. 9). Sections of this report include: the TJC model and its development; technical assistance and evaluation approach; model implementation in the learning sites; implementation and systems change approaches and evaluation findings; and conclusion. Appendixes provide: TJC Implementation Roadmap; case flow graphics; Triage Matrix Tool; Core Performance Measures Tool; baseline measures; intervention inventory; and TJC Scale Key. Moran, M. Swords to Plowshares. Institute for Veteran Policy (San Francisco, CA). Eighty-three articles published since 1990 that present a "historical framework for psychological issues in veterans as well as treatment interventions for those exhibiting criminal behavior" are described (p. 1). These articles are covered in the following sections: background; mental health and substance abuse; identifying justice-involved veterans; violence; diversion; veteran treatment courts; reentry; Veteran Justice Outreach (VJO) Program. U.S. Bureau of Prisons (BOP) (Washington, DC). "The dominant narrative around recidivism in America is that most released offenders go on to reoffend and return to prison. In new research, William Rhodes argues that this impression is wrong and that two out of every three released offenders never return to prison. He argues that previous estimates about recidivism have failed to take into account the overrepresentation of returnees in prisons. Accounting for this factor, he finds that only 11 percent of offenders return to prison more than once, and that the total time that offenders actually spend in prison is overestimated as well." This article is based on "Following Incarceration, Most Released Offenders Never Return to Prison", from the journal Crime & Delinquency (published online before print September 29, 2014). "In this dissertation I [Sohoni] examine the effect of states’ collateral consequence laws in the categories of voting, access to public records, employment, public housing, public assistance, and driver’s licenses. I examine the impact of these laws on state rates of returns to prison, as measured by percent of prison admissions that were people on conditional release when they entered prison, the percent of exits from parole that were considered unsuccessful due returning to incarceration; the percent of exits from parole that were returned to incarceration for a new sentence, and the percent of exits from parole that were returned to incarceration for a technical violation. I also run an additional fixed effects analysis on the effect of restrictions on Temporary Assistance for Needy Children (TANF) over a seven year period." This study is the first one done to address what is known empirically about how certain collateral consequence laws negatively influence the ability of ex-offenders to reenter their communities. This dissertation is comprised of five chapters: introduction to reentry and the era of mass incarceration, goals and realities of collateral consequence laws, and the current study; collateral consequence laws in the United States—overview, legal challenges and concerns, effects, and collateral consequences and recidivism; data and methods; findings regarding voting, access to records, employment, public housing, public assistance, driver's licenses, the cumulative effect, fixed effects analysis of TANF restrictions, and discussion of results; and conclusions. 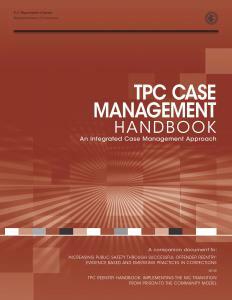 “This handbook is designed for teams of correctional and noncorrectional staff at the policy, management, and line staff levels who have been charged with implementing improvements in supervision and case management that support an overall strategy to reduce recidivism and enhance community safety through successful offender reentry” (p.1). Seven chapters are contained in this publication: an overview of the Integrated Case Management (ICM) approach; the critical challenges and strengths of the ICM approach; the nuts and bolts of the ICM approach, how it will look in practice; roles and responsibilities of staff; organizational supports, necessary resources for ICM to succeed at the case level; implementation strategy for agencies committing to ICM; and a final word on organizational and cultural change. Sample documents related to ICM are also included in the appendixes. 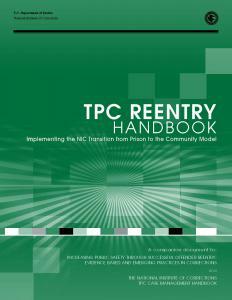 “The TPC Reentry Handbook has been developed as a resource for a broad range of stakeholders involved in improving transition and reentry practices” (p.3). Chapters comprising this manual are: transition and reentry—a key public policy issue; the Transition from Prison to the Community (TPC) model; why and how to take on the challenge of transition and reentry—lessons from the eight TPC states (Georgia, Indiana, Michigan, Missouri, New York, North Dakota, Oregon, and Rhode Island); implementing the TPC model; case management—a critical element of the TPC model; TPC performance measurement framework; and emerging issues, challenges, and opportunities. Seven grantees were included in the Cross Site Evaluation of the Bureau of Justice Assistance’s Fiscal Year 2011 Second Chance Act Adult Offender Reentry Demonstration Projects. Each project provided comprehensive reentry programming to criminal justice system involved adults under state or local custody before and after their return to the community. Target populations and service delivery approaches varied across sites. Each project, however, addressed the multiple challenges facing formerly incarcerated individuals upon their return to the community by providing an array of pre and post-release services, including education and literacy programs, job placement, housing services, and mental health and substance abuse treatment. Risk and needs assessments, transition case planning, and case management were key elements of grantees’ demonstration projects. This report describes the impacts of seven programs that were awarded grants under the Second Chance Act (SCA) Adult Demonstration Program to reduce recidivism by addressing the challenges faced by adults returning to their communities after incarceration. In estimating impacts, the evaluation used a randomized controlled trial, whereby 966 individuals eligible for SCA were randomly assigned to either a program group whose members could enroll in SCA, or a control group whose members could not enroll in SCA but could receive all other services generally available. Using survey and administrative data, each study participant was measured on a range of outcomes 18 months after random assignment. National Clearinghouse for the Defense of Battered Women (NCDBW) (Philadelphia, PA). When Victims of Battering Return to the Community after Jail or Prison: The National Clearinghouse for the Defense of Battered Women has compiled a number of resource listings about survivors as they reenter their communities after being incarcerated in prison and/or jail. U.S. Bureau of Prisons (Washington, DC). U.S. Department of Justice (Washington, DC). The Roadmap to Reentry identifies five evidence-based principles guiding federal efforts to improve the correctional practices and programs that govern the lives of those who will reenter society after incarceration. Lindquist, Christine, Willison, Janeen Buck, Rossman, Shelli, Walters, Jennifer Hardison, and Lattimore, Pamela K. National Association of Counties (NACo) (Washington, DC). This report describes the implementation challenges and successes among seven grantees who implemented adult reentry programs using SCA funding. Moe, Carolyn, Brian Titzler, Melissa Johnson-Gross, Darek Conley, Emily Blankenberger, Kirk Richardson, Bethan Owen, Caleb Griffen, Andrew Kuka, George Stanton, Lauren Troxtel, Eliu Uresti,John Thornburg, John; Nicholas Anthony Canfield, Patricia Longwood, Jessica Linder, and Amanda Britenstein.Illinois State University. Steevnson Center for Community and Economic Development (Normal, IL). Working with a local reentry organization, Labyrinth Outreach Services to Women, the purpose of this study was to gather information about opportunities and barriers related to two aspects of their program: employment services and establishment of a microbusiness. Denney, Andrew S., Richard Tewkbury, and Richard S. Jones. Alaska Department of Corrections (Anchorage, AK). A resource manual to assist reentry service providers with accessing information about services available across Ohio for people returning home from a period of incarceration. While specifically designed for Georgia, this handbook's format is a great example of an offender reentry handbook. It is based upon the Template from the Minnesota Department of Corrections. Sections following a "GDC Offender Reentry Model" flowchart include: introduction—getting organized; identification; housing; employment; careers; programs inside GDC; work ethics; transportation; money management; education; incarcerated veterans program; selective service; applying for Social Security; health and life skills; mental health services; alcohol, other drugs (AOD), and recovery; family and friend relationships; child support; living under supervision; and Georgia specific community resource contact information. "As justice-involved individuals move through the criminal-justice system, correctional staff use case management tools to monitor progress. Case management involves monitoring individuals to ensure their completion of court-ordered sanctions, such as community service hours, payment of fees, or restitution, without reoffending. The National Institute of Corrections (NIC) also expands the definition to include evaluating and assessing the need to connect justice-involved individuals to appropriate services and resources based on their risk to reoffend. "A new case management tool, the Employment Retention Inventory (ERI), is the focus of a study funded by the National Institute of Corrections. The study aims to: • Determine the effectiveness of the ERI in predicting job loss. • Identify and target the risk factors related to recidivism that also contribute to job loss. "The tool and the results of the study may be useful for employment specialists working in the field of corrections, as outcomes may affect their ability to help justice-involved individuals secure and maintain long-term employment." This fact sheet highlights what the ERI is. The ERI is being evaluated in collaboration with the Urban Institute until September 8, 2015. Planning and Implementing a Reentry Program for Clients with Co-Occurring Disorders: A Toolkit (2017). Sigman, Elena, Alexis Yeboah-Kodie, and Cindy Reed. City University of New York John Jay College of Criminal Justice Prisoner Reentry Institute (New York, NY). "The NYC Justice Corps aims to change the dynamic between justice system-involved young adults and the communities in which they live. At the heart of the program are community benefit projects — from renovation and restoration projects to educational and arts initiatives — designed and carried out by Corps members. Community benefit projects promote transformation on several levels" (p. 1). This report explains how this is done and Corps' accomplishments. VanderPyl, Taryn. Journal of Applied Juvenile Justice Services. This article focuses on services and supports or teaching employability skills at each of the stages of the juvenile justice process – before, during, and after incarceration. The psychological damage to youth resulting from incarceration is examined as well as the impact on obtaining and maintaining employment post incarceration. Resources are provided for practitioners to find evidence-based interventions and supports for the youth with whom they work. "As an increasing number of women enter the criminal legal system – and subsequently reenter their communities after serving time in prison or jail – there has also been a growing recognition that many of these women are living with substance abuse and/or mental health issues. Additionally, many of these women also have trauma and abuse histories. This internet resource listing includes research and reports that address the intersections of gender with histories of trauma and with mental health, substance abuse, or co-occurring disorders." Based on recent scientific and legal developments, there’s an urgent need to ensure that adolescent development research is incorporated into existing practices and future polices pertaining to youth … [this is an excellent] series of research-based, educational briefings on adolescent brain research, the systemic causes of youth contact with the justice system, and the implications for future legal standards and best practices … seven “deep dive” policy briefing … will each focus on a specific topic, where Vera will bring in noted experts and practitioners in the field." These topics cover status offenses, risk and needs, behavioral health, defense, family involvement, reentry, and interagency collaboration. This website provides access to the video recording of each event: 'Kick Off Event: Adolescent Development Expert Science and Legal Perspective, followed by a screening of 'Kids for Cash'”; "Making Court the Last Resort: Youth and Expert Voices on System Change"; "Examining the First Point of Contact: Youth Risk and Needs Assessment Tools"; "Meeting their Needs: Identifying and Treating Youth with Behavior Health Disorders"; "Raising the Bar: The Lawyer’s Role in Promoting Youth Justice"; "Working Together: Family Engagement with the Juvenile Justice System"; "Returning Home: Creating Paths for Success in Communities"; "Connecting the Dots: How Interagency Collaboration Can Better Serve Vulnerable Youth"; and "Wrap Up Event: Narrowing the Net, Plugging the Pipeline and Expanding Consideration of Special Populations". The research on “what works” with youth involved in the juvenile justice system has grown substantially in the last two decades. Taking account of this new research, a number of states and jurisdictions have made significant changes to their juvenile justice policies and practices. To further this pursuit, this article offers guidance that draws from the most recent research and promising practices based on the new evidence. This article focuses primarily on juvenile justice policies and practices for youth returning to their communities from out-of-home placements (e.g., secure confinement, residential placements). Topics discussed include: the reentry continuum; overarching case management; and six critical elements of juvenile reentry. Addition information and program examples are provided for each of the six elements—assessment of risk for reoffending, strengths, and needs; cognitive-behavioral interventions; family engagement; release readiness; permanency planning; and staffing and workforce competencies. Forkey, Katie. New Jersey Reentry Corporation (Jersey City, NJ). “The New Jersey Reentry Corporation (NJRC) was designed to provide supportive services to ease this transition back into the community … [and] developed a comprehensive social service model to provide for critically needed services to returning persons … The success of the program is best documented in the 19.7 percent recidivism rate and the 62 percent employment rate of our clients” (p. 4-5). This special issue of Perspectives is “is dedicated to promoting innovative programs, policies and protocols that improve crime victims’ rights and services in community corrections” (p. iii). Features of this issue cover: The Power of Information and Notification: A Victim/Survivor’s Perspective; Recommendations from the Public Hearing on Victim Issues in Probation and Parole: August 18, 2010; Crime Victims and Offender Reentry; Victim Services Provided Through The Allen County, Indiana Reentry Court Program; Victim Awareness: A Model of Problem-Solving Justice; Restitution Court: A Victim Centered Approach to Restitution Collection in Maricopa County, Arizona; Victims and the Juvenile Justice System; National Information and Referral Resources for Crime Victim/Survivor Assistance; When the Offender Becomes A Victim: Identifying and Responding To Corrections-Based Sexual Abuse; Negotiating Ethical Issues in Providing Services to Victims Of Crime; The Emergence and Evolution of Technology to Benefit Crime Victims; Domestic Violence & Stalking in a Digital Age: Information for Community Corrections Agencies & Professionals; Community Corrections Officers: A Key Resource In The Battle Against Stalking; and A Victim-Centered Approach to Supervising Internet Harassment Offenders. “The Vision 21: Transforming Victim Services Final Report presents a cohesive and comprehensive framework for strategic change in the victim services field and addresses ways to overcome political, policy, and philosophical challenges in the field. OVC anticipates that this report will catalyze important first steps in the strategic direction and focus of the victim assistance field. “ Six chapters follow an executive summary: forging a future informed by research; meeting the holistic legal needs of crime victims; extending the vision—reaching all victims of crime; serving crime victims in the digital age; building capacity to serve all victims; and making the “vision” a reality—recommendations for action.